Chef Gusteau‘s cookbook “Anyone Can Cook!” resonates as I enrolled in a local art class. I did not realize that “Anyone Can Paint!“, but with an Instructor like George Bussey, it certainly feels like anyone can. An email circulated by a colleague noted that George’s Art Studio was holding an painting class on Wednesday, June 8th from 6-9 PM. It noted that you would have the opportunity to paint a 18″X24″ painting with all supplies included for a mere cost of $30.00. I am interested in art, painting and continuous learning, thus, I did not hesitate to pick up the phone and dial 1-709-454-4070. I was greeted by a friendly voice at the other end, “George’s Art Studio”. I inquired about the class. Mr. Bussey noted they are kept to a minimum of 7 students to ensure that each student can get some one-on-one attention. I agreed to attend and circulated to my co-workers. I had one taker and we were able to carpool as St. Anthony is 150 km from Plum Point, NL. George’s Art Studio is located at the Upper Level of the Viking Mall, St. Anthony, NL. He has quite the set up which displays his own art, a private studio/office for him to complete his own work, classroom and a small storefront for anyone needing art supplies. On the wall was our painting – a harbour with iceberg and some trees. It certainly did not look like a beginners painting, but George assured us all that we could do it. The atmosphere for learning was warm and playful, with an opportunity to smile and joke with other students as we all hesitantly took some of our brush strokes. George taught us how to mix paint, accent, layer, use different brushes and let us know that we could not make a mistake as we could just paint over it. He reminded me of Bob Ross of PBS – as he made painting look easy. George was more than helpful and multi-talented. Three hours of enjoyment flew by and at the end there was a completed painting. I was skeptical that it could be done, but with George maintaining a good pace and keeping us all on track we all did it! 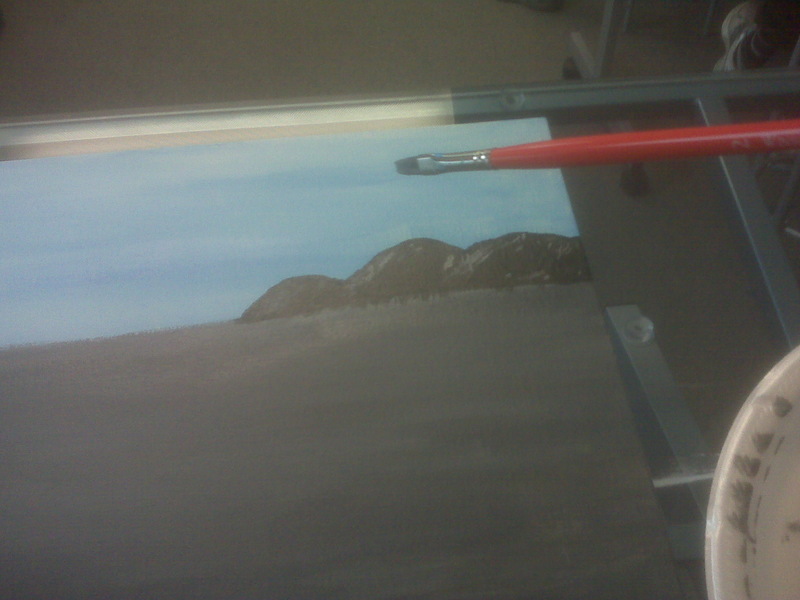 I am so happy with my first attempt at painting and can not wait to take my next class with Mr. Bussey. George currently continues his night classes on Monday, Wednesday and Friday. Drop by his Art Studio at the Viking Mall or call 709-454-4070 to reserve your seat and you too can frame your own artwork after one class! I continue to be impressed with all the opportunity and talent that exists on the Great Northern Peninsula. 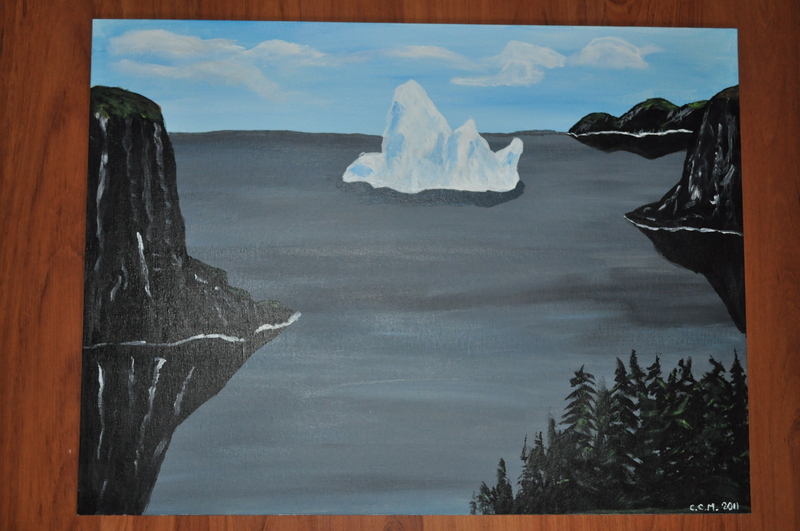 Posted on June 9, 2011, in Announcements, Art, Business, Landscapes/Geography and tagged art, Art Studio, Bob Ross, class, George Bussey, Great Northern Peninsula, harbour, Iceberg, List of artistic media, Newfoundland, Paint, Rural, St. Anthony, Studio, Visual arts. Bookmark the permalink. 2 Comments.